Transposition of the great arteries (TGA) is the most common cyanotic congenital heart lesion that presents in neonates. The hallmark of transposition of the great arteries is ventriculoarterial discordance, in which the aorta arises from the morphologic right ventricle and the pulmonary artery arises from the morphologic left ventricle. See the image below. This right ventricular angiogram shows a patient with transposition of the great arteries. The aorta arises directly from the right-sided anterior right ventricle (10° left anterior oblique [LAO]). Although transposition of the great arteries was first described over 2 centuries ago, no treatment was available until the middle of the 20th century, with the development of surgical atrial septectomy in the 1950s and balloon atrial septostomy in the 1960s. These palliative therapies were followed by physiological procedures (atrial switch operation) and anatomic repair (arterial switch operation) (see the videos below). Today, the survival rate for infants with transposition of the great arteries is greater than 90%. This video shows the repair of a newborn with transposition of the great arteries and ventricular septal defect (VSD) by means of arterial switch and VSD closure. Procedure performed by Giles Peek MD, FRCS, CTh, FFICM, The Children’s Hospital at Montefiore, Bronx, NY. Video courtesy of Montefiore. Switch ventricular septal defect (VSD hypoplastic right arch). Procedure performed by Giles Peek MD, FRCS, CTh, FFICM, The Children’s Hospital at Montefiore, Bronx, NY. Video courtesy of Montefiore. The major anatomic classifications of transposition of the great arteries depend on the relationship of the great arteries to each other and/or the infundibular morphology. In approximately 60% of the patients, the aorta is anterior and to the right of the pulmonary artery (dextro-transposition of the great arteries [d-TGA]). However in a subset of patients, the aorta may be anterior and to the left of the pulmonary artery (levo-transposition of the great arteries [l-TGA]). In addition, most patients with transposition of the great arteries (regardless of the spacial orientation of the great arteries) have a subaortic infundibulum, an absence of subpulmonary infundibulum, and fibrous continuity between the mitral valve and the pulmonary valve. Despite these useful classifications, several exceptions are noted, and, hence, discordant ventriculoarterial connection is the only distinguishing characteristic that defines transposition of the great arteries. From a practical standpoint, the presence or absence of associated cardiac anomalies defines the clinical presentation and surgical management of a patient with transposition of the great arteries. The primary anatomic subtypes are (1) transposition of the great arteries with intact ventricular septum, (2) transposition of the great arteries with ventricular septal defect, (3) transposition of the great arteries with ventricular septal defect and left ventricular outflow tract obstruction, and (4) transposition of the great arteries with ventricular septal defect and pulmonary vascular obstructive disease. In approximately one third of patients with transposition of the great arteries, the coronary artery anatomy is abnormal, with a left circumflex coronary arising from the right coronary artery (22%), a single right coronary artery (9.5%), a single left coronary artery (3%), or inverted origin of the coronary arteries (3%) representing the most common variants. The pulmonary and systemic circulations function in parallel, rather than in series. Oxygenated pulmonary venous blood returns to the left atrium and left ventricle but is recirculated to the pulmonary vascular bed via the abnormal pulmonary arterial connection to the left ventricle. Deoxygenated systemic venous blood returns to the right atrium and right ventricle where it is subsequently pumped to the systemic circulation, effectively bypassing the lungs. This parallel circulatory arrangement results in a deficient oxygen supply to the tissues and an excessive right and left ventricular workload. It is incompatible with prolonged survival unless mixing of oxygenated and deoxygenated blood occurs at some anatomic level. This two-dimensional echocardiogram (parasternal long-axis view) shows a patient with transposition of the great arteries and ventricular septal defect (VSD). The pulmonary artery arises from the posterior (left) ventricle, dives posteriorly, and then bifurcates immediately into the left and right branch pulmonary arteries. A large VSD is present in the outlet septum. This two-dimensional echocardiogram (apical 4-chamber view) shows a patient with transposition of the great arteries and ventricular septal defect. The anterior aorta arises from the right-sided right ventricle. One or all of these lesions can be present in concert with dextro-transposition of the great arteries, and the degree of arterial hypoxemia depends on the degree of anatomic mixing. The etiology for transposition of the great arteries is unknown and is presumed to be multifactorial. 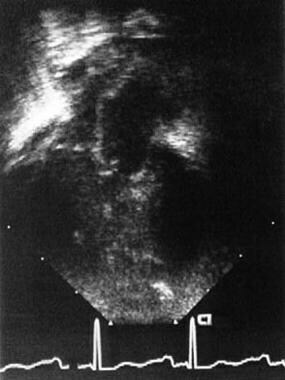 The embryology likely involves abnormal persistence of the subaortic conus with resorption or underdevelopment of the subpulmonary conus (infundibulum). This abnormality aligns the aorta anterior and superior with the right ventricle during development. Despite its overall low prevalence, transposition of the great arteries is the most common etiology for cyanotic congenital heart disease in the newborn. This lesion presents in 5-7% of all patients with congenital heart disease. The overall annual incidence is 20-30 per 100,000 live births, and inheritance is multifactorial. Transposition of the great arteries is isolated in 90% of patients and is rarely associated with syndromes or extracardiac malformations. This congenital heart defect is more common in infants of diabetic mothers. No racial predilection is known, but transposition of the great arteries has a 60-70% male predominance. Patients with transposition of the great arteries usually present with cyanosis in the newborn period, but clinical manifestations and courses are influenced predominantly by the degree of intercirculatory mixing. The prognosis depends on the specific anatomic substrate and type of surgical therapy used (arterial switch operation, atrial switch operation, or Rastelli procedure). The mortality rate in untreated patients is approximately 30% in the first week, 50% in the first month, and 90% by the end of the first year. Long-term complications are secondary to prolonged cyanosis and include polycythemia and hyperviscosity syndrome. These patients may develop headache, decreased exercise tolerance, and stroke. Thrombocytopenia is common in patients with cyanotic congenital heart disease leading to bleeding complications. With improved diagnostic, medical, and surgical techniques, the overall short-term and midterm survival rate exceeds 90%. Patients with a large ventricular septal defect, a patent ductus arteriosus, or both may have an early predilection for congestive heart failure, as pulmonary vascular resistance falls with increasing age. Heart failure may be mitigated in those patients with left ventricular outflow tract (pulmonary) stenosis. Arterioplasty in patients with supravalve pulmonary or pulmonary artery branch stenosis following arterial switch surgery may be an effective and durable management option in the immediate term. In a retrospective study (2004-2013) comprising 223 patients who underwent arterial switch for transposition of the great arteries, 38 patients (16%) developed supravalve pulmonary stenosis within 12.5 months. The surgical morbidity (eg, main pulmonary artery plasty) was 13%, without hospital or late mortality. At the 41.2 months postsurgical follow-up, all the patients had New York Heart Association (NYHA) functional grade 0 or 1 symptoms. Cardiac catheterization and endovascular stenting of the branch pulmonary arteries is an alternative in older patients versus cardiac surgery. A retrospective study (1995-2016) that evaluated midterm outcomes in 97 patients with congenitally corrected transposition of the great arteries who underwent different management strategies reported similar transplant-free survival in those who underwent a systemic right ventricle (93%), anatomic repair (86%), and Fontan procedure (100%) (there was a 79% transplant-free survival for pulmonary artery band or shunt) (P = 0.33). Multivariate analysis demonstrated systemic right ventricular dysfunction as a risk factor for death or transplantation. A small percentage (approximately 5%) of patients with transposition of the great arteries (and often a ventricular septal defect) develop accelerated pulmonary vascular obstructive disease and progressive cyanosis despite surgical repair or palliation. Long-term survival in this subgroup is particularly poor. Family members should learn cardiopulmonary resuscitation (CPR). Educate family members about congenital heart disease. Obtain genetics counseling for future pregnancy, despite the relatively low risk of recurrence. Rao PS. Diagnosis and management of cyanotic congenital heart disease: part I. Indian J Pediatr. 2009 Jan. 76 (1):57-70. [Medline]. Khairy P, Clair M, Fernandes SM, et al. Cardiovascular outcomes after the arterial switch operation for D-transposition of the great arteries. Circulation. 2013 Jan 22. 127 (3):331-9. [Medline]. Watanabe N, Mainwaring RD, Carrillo SA, Lui GK, Reddy VM, Hanley FL. Left ventricular retraining and late arterial switch for D-transposition of the great arteries. Ann Thorac Surg. 2015 May. 99 (5):1655-61; discussion 1661-3. [Medline]. Co-Vu JG, Ginde S, Bartz PJ, Frommelt PC, Tweddell JS, Earing MG. Long-term outcomes of the neoaorta after arterial switch operation for transposition of the great arteries. Ann Thorac Surg. 2013 May. 95 (5):1654-9. [Medline]. Wiggins LM, Kumar SR, Starnes VA, Wells WJ. Arterioplasty for right ventricular outflow tract obstruction after arterial switch is a durable procedure. Ann Thorac Surg. 2015 Jul. 100 (1):122-7; discussion 127-8. [Medline]. De Leon LE, Mery CM, Verm RA, et al. Mid-term outcomes in patients with congenitally corrected transposition of the great arteries: a single center experience. J Am Coll Surg. 2017 Apr. 224 (4):707-15. [Medline]. Maeda T, Koide M, Kunii Y, Watanabe K, Kanzaki T, Ohashi Y. Supravalvular aortic stenosis after arterial switch operation. Asian Cardiovasc Thorac Ann. 2016 Jul. 24 (6):578-80. [Medline]. Vaujois L, Boucoiran I, Preuss C, et al. Relationship between interatrial communication, ductus arteriosus, and pulmonary flow patterns in fetuses with transposition of the great arteries: prediction of neonatal desaturation. Cardiol Young. 2017 Apr 5. 1-9. [Medline]. Rydman R, Gatzoulis MA, Ho SY, et al. Systemic right ventricular fibrosis detected by cardiovascular magnetic resonance is associated with clinical outcome, mainly new-onset atrial arrhythmia, in patients after atrial redirection surgery for transposition of the great arteries. Circ Cardiovasc Imaging. 2015 May. 8 (5):[Medline]. Dominguez-Manzano P, Herraiz I, Mendoza A, et al. Impact of prenatal diagnosis of transposition of the great arteries on postnatal outcome. J Matern Fetal Neonatal Med. 2016 Dec 14. 1-6. [Medline]. Wypij D, Newburger JW, Rappaport LA, et al. The effect of duration of deep hypothermic circulatory arrest in infant heart surgery on late neurodevelopment: the Boston Circulatory Arrest Trial. J Thorac Cardiovasc Surg. 2003 Nov. 126 (5):1397-403. [Medline]. [Guideline] Wilson W, Taubert KA, Gewitz M, et al. Prevention of infective endocarditis: guidelines from the American Heart Association: a guideline from the American Heart Association Rheumatic Fever, Endocarditis and Kawasaki Disease Committee, Council on Cardiovascular Disease in the Young, and the Council on Clinical Cardiology, Council on Cardiovascular Surgery and Anesthesia, and the Quality of Care and Outcomes Research Interdisciplinary Working Group. J Am Dent Assoc. 2007 Jun. 138(6):739-45, 747-60. [Medline]. [Full Text]. Horer J, Schreiber C, Dworak E, et al. Long-term results after the Rastelli repair for transposition of the great arteries. Ann Thorac Surg. 2007 Jun. 83 (6):2169-75. [Medline]. Kampmann C, Kuroczynski W, Trubel H, Knuf M, Schneider M, Heinemann MK. Late results after PTCA for coronary stenosis after the arterial switch procedure for transposition of the great arteries. Ann Thorac Surg. 2005 Nov. 80 (5):1641-6. [Medline]. Neches WH, Park SC, Ettedgui, JA. Transposition of the great arteries. In: Garson A Jr, Bricker JT, Fisher DJ, Neish SR, eds. The Science and Practice of Pediatric Cardiology. Baltimore, Md: Lippincott Williams & Wilkins; 1998. Vol 1: 1463-503. Paul MH, Wernovsky G. Transposition of the great arteries. In: Emmanouilides GC, Allen HD, Riemenschneider TA, Gutgesell HP, eds. Moss and Adams Heart Disease in Infants, Children, and Adolescents, Including the Fetus and Young Adult. 5th ed. Baltimore, Md: Williams & Wilkins; 1995. Vol 2: 1154-224. Pedra SR, Pedra CA, Abizaid AA, et al. Intracoronary ultrasound assessment late after the arterial switch operation for transposition of the great arteries. J Am Coll Cardiol. 2005 Jun 21. 45 (12):2061-8. [Medline]. Takeuchi D, Nakanishi T, Tomimatsu H, Nakazawa M. Evaluation of right ventricular performance long after the atrial switch operation for transposition of the great arteries using the Doppler Tei index. Pediatr Cardiol. 2006 Jan-Feb. 27 (1):78-83. [Medline]. Alton GY, Rempel GR, Robertson CM, Newburn-Cook CV, Norris CM. Functional outcomes after neonatal open cardiac surgery: comparison of survivors of the Norwood staged procedure and the arterial switch operation. Cardiol Young. 2010 Dec. 20 (6):668-75. [Medline]. El-Segaier M, Lundin A, Hochbergs P, Jogi P, Pesonen E. Late coronary complications after arterial switch operation and their treatment. Catheter Cardiovasc Interv. 2010 Dec 1. 76 (7):1027-32. [Medline]. Metton O, Gaudin R, Ou P, Gerelli S, et al. Early prophylactic pulmonary artery banding in isolated congenitally corrected transposition of the great arteries. Eur J Cardiothorac Surg. 2010 Dec. 38 (6):728-34. [Medline]. Roubertie F, Thambo JB, Bretonneau A, et al. Late outcome of 132 Senning procedures after 20 years of follow-up. Ann Thorac Surg. 2011 Dec. 92 (6):2206-13; discussion 2213-4. [Medline]. Murtuza B, Barron DJ, Stumper O, et al. Anatomic repair for congenitally corrected transposition of the great arteries: a single-institution 19-year experience. J Thorac Cardiovasc Surg. 2011 Dec. 142 (6):1348-57.e1. [Medline]. Oliver JM, Gallego P, Gonzalez AE, et al. Comparison of outcomes in adults with congenitally corrected transposition with situs inversus versus situs solitus. Am J Cardiol. 2012 Dec 1. 110 (11):1687-91. [Medline]. Boris JR. Primary care management of patients with common arterial trunk and transposition of the great arteries. Cardiol Young. 2012 Dec. 22 (6):761-7. [Medline]. Tobler D, Motwani M, Wald RM, et al. Evaluation of a comprehensive cardiovascular magnetic resonance protocol in young adults late after the arterial switch operation for d-transposition of the great arteries. J Cardiovasc Magn Reson. 2014 Dec 11. 16:98. [Medline]. Biglino G, Ntsinjana H, Plymen C, et al. Ventriculovascular interactions late after atrial and arterial repair of transposition of the great arteries. J Thorac Cardiovasc Surg. 2014 Dec. 148 (6):2627-33. [Medline]. Fundora MP, Aregullin EO, Wernovsky G, et al. Echocardiographic and surgical correlation of coronary artery patterns in transposition of the great arteries. Congenit Heart Dis. 2016 Dec. 11 (6):570-7. [Medline]. Adachi O, Masaki N, Kawatsu S, et al. Long-term results after physiologic repair for congenitally corrected transposition of the great arteries. Gen Thorac Cardiovasc Surg. 2016 Dec. 64 (12):715-21. [Medline]. Nield LE, Dragulescu A, MacColl C, et al. Coronary artery Doppler patterns are associated with clinical outcomes post-arterial switch operation for transposition of the great arteries. Eur Heart J Cardiovasc Imaging. 2017 Mar 28. [Medline]. 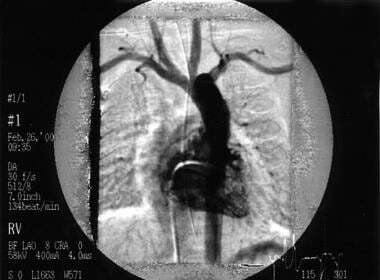 This right ventricular angiogram shows a patient with transposition of the great arteries. The aorta arises directly from the right-sided anterior right ventricle (70° left anterior oblique [LAO]). This left ventricular angiogram shows a patient with transposition of the great arteries. The pulmonary artery arises directly from the left-sided posterior left ventricle (30° right anterior oblique [RAO]). This left ventricular angiogram shows a patient with transposition of the great arteries. The pulmonary artery arises directly from the left-sided posterior left ventricle (20° cranial). 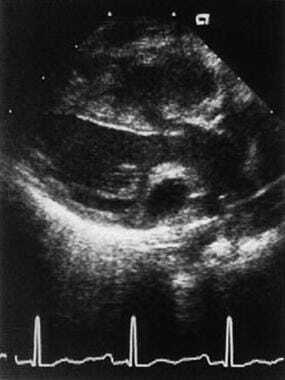 This echocardiographic video (subcostal view) in a 1-day-old newborn reveals transposition of the great vessels and inadequate intracardiac mixing at the atrial level, resulting in severe desaturation. The video was obtained before the infant underwent balloon atrial septostomy. Video courtesy of Howard S Weber, MD, FSCAI. This two-dimensional echocardiographic video (subcostal view) was obtained immediately following emergent balloon atrial septostomy in the same newborn discussed in the previous video. It now demonstrates a nonrestrictive atrial communication, which resulted in alleviation of the infant's cyanosis. Video courtesy of Howard S Weber, MD, FSCAI.